Three multinucleated, giant cell granulomas observed in a fine-needle aspiration biopsy of the thyroid; from a patient with thyrotoxicosis resulting from subacute granulomatous thyroiditis. For patient education information, see the Thyroid and Metabolism Center, as well as Thyroid Problems. Destruction of follicular epithelium and loss of follicular integrity are the primary events in the pathophysiology of subacute granulomatous thyroiditis. Thyroglobulin (TG), thyroid hormones, and other iodinated compounds are released into the blood, often in quantities sufficient to elevate the serum thyroxine (T4) and triiodothyronine (T3) concentrations and suppress thyroid-stimulating hormone (TSH) secretion. This state lasts until the stores of TG are exhausted or until healing occurs. Thyroidal iodine uptake and new hormone synthesis temporarily ceases because of the low level of TSH. As inflammation subsides, the thyroid follicles regenerate and thyroid hormone synthesis and secretion resume. In some patients, several months are required for thyroid hormone synthesis to return to a normal rate; during that period, clinical hypothyroidism may be evident. The hypermetabolic effect of thyrotoxicosis is the same, regardless of cause. Thyrotoxicosis affects every organ system, because thyroid hormones made in the thyroid travel via the circulation to reach every cell in the body. Thyroid hormone is necessary for normal growth and development, and it regulates cellular metabolism. Excess thyroid hormone causes an increase in metabolic rate that is associated with increased total body heat production, increased cardiovascular activity (eg, increased heart contractility, heart rate, vasodilation) to remove heat to the periphery and remove metabolic wastes, and perspiration to cool the body. Synergism occurs between thyrotoxicosis and the adrenergic system, with increases in nervousness, stare, tremor, and tachycardia. The manifestations of thyrotoxicosis vary among patients. Younger patients tend to exhibit more sympathetic activations (eg, anxiety, hyperactivity, tremor), while older patients have more cardiovascular symptoms (eg, dyspnea, atrial fibrillation) and unexplained weight loss. The clinical manifestation of thyrotoxicosis does not always correlate with the extent of the biochemical abnormality. The causes of subacute thyroiditis, other than those of subacute granulomatous thyroiditis, are not entirely clear. It is unclear, however, whether the destructive thyroiditis in De Quervain patients is caused by direct viral infection of the gland or by the host's response to the viral infection. In contrast to autoimmune thyroid disease, the immune response in subacute granulomatous thyroiditis is not self-perpetuating; therefore, the process is limited. A genetic predisposition to the development subacute granulomatous thyroiditis clearly exists; risk for developing the disease in patients with human leukocyte antigen (HLA)–Bw35 is 6-fold that of the general population. In one study, as many as 72% of patients with subacute thyroiditis manifested HLA-Bw35. A proposed etiologic mechanism suggests that the disease results from a viral infection that provides an antigen, one that is either viral or that results from virus-induced host tissue damage, that uniquely binds to HLA-B35 molecules on macrophages. The antigen–HLA-B35 complex activates cytotoxic T lymphocytes that damage thyroid follicular cells, because these cells have some structural similarity to the infection-related antigen. In Japanese patients, an association seems to exist between subacute granular thyroiditis and HLA-B67. In a study, 87% of Japanese patients with subacute thyroiditis had either HLA-B35 or HLA-B67. Research indicates that HLA-B67 is associated with a greater risk of developing a hypothyroid phase than is HLA-Bw35. The role of growth factors in the development of subacute thyroiditis has received some attention. In the granulomatous stage of subacute thyroiditis, growth factor–rich monocytes and/or macrophages infiltrating follicular lumina are thought to trigger the granulomatous reaction, with this reaction probably being mediated by vascular endothelial growth factor (VEGF), basic fibroblast growth factor (bFGF), platelet-derived growth factor (PDGF), and transforming growth factor beta 1 (TGF-β1) produced by the stromal cells. In the regenerative phase, endothelial growth factor (EGF) mediates follicular regeneration through its mitogenic effect on thyrocytes, along with cofactors. In addition, the decreased expression of TGF-β1, a fibrogenic factor, contributes to thyroid tissue repair. VEGF and bFGF may be responsible for angiogenesis in both stages. This condition most likely is autoimmune in nature. Patients develop an autoimmune goiter and permanent hypothyroidism more often than they do with subacute granulomatous thyroiditis. An HLA association may be present, suggesting a genetic predisposition to subacute lymphocytic thyroiditis. Certain drug exposures relating to excess iodine and cytokines may cause this form of silent thyroiditis. These drugs include amiodarone (iodine-rich), interferon alfa, interleukin 2, and lithium. Cases of thyroiditis resulting from these drugs are typically treated in a similar way. Up to 5% of patients taking interferon alfa may experience subacute lymphocytic thyroiditis. This condition is detected biochemically, after 3 months of therapy, more often than it is found clinically. Subacute lymphocytic thyroiditis in patients taking interferon alfa is associated with an increased antithyroid antibody concentration. Although case reports exist that interleukin 2 is associated with subacute lymphocytic thyroiditis, its causative role is less established than that of interferon alfa. Lithium is a well-known cause of either subclinical or clinical hypothyroidism, as well as of goiter. Because of lithium’s ability to inhibit the release of thyroid hormone, it has been used as a treatment for thyrotoxicosis. However, reports exist of lithium-associated thyrotoxicosis due to a subacute lymphocytic thyroiditis, with the classic picture of hyperthyroidism, absent neck tenderness, and low radioactive iodine uptake. Subacute lymphocytic thyroiditis can occur during lithium administration, as well as up to 5 months following discontinuation of lithium therapy. Increased thyroid antibodies in lithium users and a direct toxic effect of lithium have been proposed as possible mechanisms. This condition is likely autoimmune in nature. Patients develop an autoimmune goiter and permanent hypothyroidism more often than they do with subacute granulomatous thyroiditis. In iodine-sufficient countries, such as the United States, postpartum thyroiditis occurs in approximately 5-8% of pregnant women. In Japan where the diet is rich in iodine, nearly 20% of pregnancies are associated with this condition. Patients with positive test results for thyroid autoantibodies either before their pregnancy or during the third trimester are at much higher risk of developing postpartum thyroiditis. Cigarette smoking is also associated with an increased incidence of postpartum thyroiditis. Once patients have an episode of subacute postpartum thyroiditis, they are likely to have additional episodes following each pregnancy. Subacute granulomatous thyroiditis occurs in less than 5% of all patients with thyroid pathology, although estimates indicate that together, the 3 forms of subacute thyroiditis account for 20-25% of thyrotoxicosis cases. De Quervain thyroiditis tends to have a seasonal and geographic distribution and is most common during the summer and fall. It tends to follow viral epidemics. As is the case for most thyroid diseases, de Quervain thyroiditis appears more frequently in females, with a female-to-male ratio of 3-5:1. Subacute lymphocytic thyroiditis occurs twice as often in women as it does in men. Postpartum thyroiditis occurs 1-6 months after giving birth. If a woman has postpartum thyroiditis with one baby, all other pregnancies are likely to be associated with this condition. Subacute lymphocytic thyroiditis can occur in any age group, while postpartum thyroiditis occurs in women of childbearing age. The prognosis is excellent in 90-95% of patients who experience subacute thyroiditis. Approximately 5-10% of patients have permanent thyroid dysfunction, usually hypothyroidism, after an episode of subacute thyroiditis. Permanent goiter and thyroid dysfunction occur most frequently after postpartum thyroiditis. Thyrotoxicosis from subacute thyroiditis is brief, usually lasting no longer than 6-8 weeks. Patients can be extremely thyrotoxic during this period and can appear extremely ill, but concerns regarding left ventricular hypertrophy and osteoporosis are not as great as those associated with conditions of permanent hyperthyroidism. However, sudden-onset thyrotoxicosis and severe thyrotoxicosis can be associated with atrial arrhythmia and congestive heart failure (CHF). This condition generally resolves completely in more than 90-95% of patients. No special thyroidal follow-up is needed. Morbidity is caused during the initial phase by pain, which usually prompts the patient to consult a physician. Hyperthyroidism, usually a mild, transient form, occurs in approximately 50% of patients with subacute granulomatous thyroiditis; in up to half of all patients, hypothyroidism may later develop. Permanent hypothyroidism is the most frequent long-term complication of de Quervain thyroiditis. It is observed in less than 5-10% of the patients and requires thyroid replacement therapy. Disease recurrence has been documented in occasional cases (up to 20% of cases in some series). Recurrence is more frequent in the first year but has been reported even 30 years after the initial diagnosis. The risk of recurrence cannot be correlated with initial thyroid function, inflammatory syndrome, or ultrasonographic aspect (ie, thyroid volume, echogenicity). Occasionally, patients have recurrent episodes of painless thyrotoxicosis. No treatment exists to prevent the recurrences except subtotal thyroidectomy. However, this condition generally resolves completely in more than 90-95% of patients. Patients with goiters or permanent thyroid dysfunction should be monitored with a thyroid examination and thyroid function tests every 6 months. Usually, repeat episodes occur after each pregnancy; no known treatment exists to prevent these. Patients may have a residual goiter and thyroid hypofunction after postpartum thyroiditis, because this condition is associated with chronic autoimmune thyroiditis. Patients should be observed routinely for goiter enlargement and thyroid hypofunction every 6-12 months. Tabassom A, Edens MA. De Quervain Thyroiditis. 2018 Jan. [Medline]. [Full Text]. Gul N, Uzum AK, Selcukbiricik OS, Yegen G, Tanakol R, Aral F. Prevalence of papillary thyroid cancer in subacute thyroiditis patients may be higher than it is presumed: retrospective analysis of 137 patients. Radiol Oncol. 2018 Sep 11. 52 (3):257-62. [Medline]. [Full Text]. Desailloud R, Hober D. Viruses and thyroiditis: an update. Virol J. 2009 Jan 12. 6:5. [Medline]. [Full Text]. Dimos G, Pappas G, Akritidis N. Subacute thyroiditis in the course of novel H1N1 influenza infection. Endocrine. 2010 Jun. 37(3):440-1. [Medline]. Ohsako N, Tamai H, Sudo T, Mukuta T, Tanaka H, Kuma K, et al. Clinical characteristics of subacute thyroiditis classified according to human leukocyte antigen typing. J Clin Endocrinol Metab. 1995 Dec. 80(12):3653-6. [Medline]. Basaria S, Cooper DS. Amiodarone and the thyroid. Am J Med. Jul 2005. 118(7):706-14. Filippi U, Brizzolara R, Venuti D, Cesarone A, Maritati VA, Podestà M, et al. Prevalence of post-partum thyroiditis in Liguria (Italy): an observational study. J Endocrinol Invest. 2008 Dec. 31(12):1063-8. [Medline]. Fatourechi V, Aniszewski JP, Fatourechi GZ, Atkinson EJ, Jacobsen SJ. Clinical features and outcome of subacute thyroiditis in an incidence cohort: Olmsted County, Minnesota, study. J Clin Endocrinol Metab. 2003 May. 88(5):2100-5. [Medline]. Stagnaro-Green A. Approach to the patient with postpartum thyroiditis. J Clin Endocrinol Metab. 2012 Feb. 97(2):334-42. [Medline]. Ogawa E, Katsushima Y, Fujiwara I, Iinuma K. Subacute thyroiditis in children: patient report and review of the literature. J Pediatr Endocrinol Metab. 2003 Jul-Aug. 16(6):897-900. [Medline]. Hiraiwa T, Kubota S, Imagawa A, Sasaki I, Ito M, Miyauchi A, et al. Two cases of subacute thyroiditis presenting in pregnancy. J Endocrinol Invest. 2006 Nov. 29(10):924-7. [Medline]. Kubota S, Nishihara E, Kudo T, Ito M, Amino N, Miyauchi A. Initial treatment with 15 mg of prednisolone daily is sufficient for most patients with subacute thyroiditis in Japan. Thyroid. 2013 Mar. 23 (3):269-72. [Medline]. Nishimaki M, Isozaki O, Yoshihara A, Okubo Y, Takano K. Clinical characteristics of frequently recurring painless thyroiditis: contributions of higher thyroid hormone levels, younger onset, male gender, presence of thyroid autoantibody and absence of goiter to repeated recurrence. Endocr J. 2009. 56(3):391-7. [Medline]. Sherman SI, Ladenson PW. Subacute thyroiditis causing thyroid storm. Thyroid. 2007 Mar. 17(3):283. [Medline]. De Groot L, Abalovich M, Alexander EK, Amino N, Barbour L, Cobin RH, et al. Management of thyroid dysfunction during pregnancy and postpartum: an Endocrine Society clinical practice guideline. J Clin Endocrinol Metab. 2012 Aug. 97(8):2543-65. [Medline]. Masuoka H, Miyauchi A, Tomoda C, Inoue H, Takamura Y, Ito Y, et al. Imaging studies in sixty patients with acute suppurative thyroiditis. Thyroid. 2011 Oct. 21(10):1075-80. [Medline]. Zein EF, Karaa SE, Megarbane A. Familial occurrence of painful subacute thyroiditis associated with human leukocyte antigen-B35. Presse Med. 2007 May. 36(5 Pt 1):808-9. [Medline]. Salvi A, Spandrio S, Tosoni M, Rossi M, Balestrieri GP, Candrina R. Liver enzyme abnormalities in subacute thyroiditis. Recenti Prog Med. 1990 Nov. 81(11):686-8. [Medline]. Nishihara E, Ohye H, Amino N, Takata K, Arishima T, Kudo T, et al. Clinical characteristics of 852 patients with subacute thyroiditis before treatment. Intern Med. 2008. 47(8):725-9. [Medline]. Jhaveri K, Shroff MM, Fatterpekar GM, Som PM. CT and MR imaging findings associated with subacute thyroiditis. AJNR Am J Neuroradiol. 2003 Jan. 24(1):143-6. [Medline]. Tezuka M, Murata Y, Ishida R, Ohashi I, Hirata Y, Shibuya H. MR imaging of the thyroid: correlation between apparent diffusion coefficient and thyroid gland scintigraphy. J Magn Reson Imaging. 2003 Feb. 17(2):163-9. [Medline]. Hiromatsu Y, Ishibashi M, Miyake I, Nonaka K. Technetium-99m tetrofosmin imaging in patients with subacute thyroiditis. Eur J Nucl Med. 1998 Oct. 25(10):1448-52. [Medline]. Bennedbaek FN, Hegedüs L. The value of ultrasonography in the diagnosis and follow-up of subacute thyroiditis. Thyroid. 1997 Feb. 7(1):45-50. [Medline]. Birchall IW, Chow CC, Metreweli C. Ultrasound appearances of de Quervain's thyroiditis. Clin Radiol. 1990 Jan. 41(1):57-9. [Medline]. Brander A. Ultrasound appearances in de Quervain's subacute thyroiditis with long-term follow-up. J Intern Med. 1992 Oct. 232(4):321-5. [Medline]. Park SY, Kim EK, Kim MJ, Kim BM, Oh KK, Hong SW, et al. Ultrasonographic characteristics of subacute granulomatous thyroiditis. Korean J Radiol. 2006 Oct-Dec. 7(4):229-34. [Medline]. [Full Text]. Xie P, Xiao Y, Liu F. Real-time ultrasound elastography in the diagnosis and differential diagnosis of subacute thyroiditis. J Clin Ultrasound. 2011 Oct. 39(8):435-40. [Medline]. Omori N, Omori K, Takano K. Association of the ultrasonographic findings of subacute thyroiditis with thyroid pain and laboratory findings. Endocr J. 2008 Jul. 55(3):583-8. [Medline]. Cappelli C, Pirola I, Gandossi E, Formenti AM, Agosti B, Castellano M. Ultrasound findings of subacute thyroiditis: a single institution retrospective review. Acta Radiol. 2014 May. 55 (4):429-33. [Medline]. Frates MC, Marqusee E, Benson CB, Alexander EK. Subacute granulomatous (de Quervain) thyroiditis: grayscale and color Doppler sonographic characteristics. J Ultrasound Med. 2013 Mar. 32 (3):505-11. [Medline]. Pan FS, Wang W, Wang Y, et al. Sonographic features of thyroid nodules that may help distinguish clinically atypical subacute thyroiditis from thyroid malignancy. J Ultrasound Med. 2015 Apr. 34 (4):689-96. [Medline]. Kunz A, Blank W, Braun B. De Quervain's subacute thyroiditis -- colour Doppler sonography findings. Ultraschall Med. 2005 Apr. 26(2):102-6. [Medline]. Lee YJ, Kim DW. Sonographic Characteristics and Interval Changes of Subacute Thyroiditis. J Ultrasound Med. 2016 Aug. 35 (8):1653-9. [Medline]. Ruchala M, Szczepanek-Parulska E, Zybek A, Moczko J, Czarnywojtek A, Kaminski G, et al. The role of sonoelastography in acute, subacute and chronic thyroiditis: a novel application of the method. Eur J Endocrinol. 2012 Mar. 166(3):425-32. [Medline]. Chang TC, Lai SM, Wen CY, Hsiao YL. Three-dimensional cytomorphology in fine needle aspiration biopsy of subacute thyroiditis. Acta Cytol. 2004 Mar-Apr. 48(2):155-60. [Medline]. García Solano J, Giménez Bascuñana A, Sola Pérez J, Campos Fernández J, Martínez Parra D, Sánchez Sánchez C, et al. 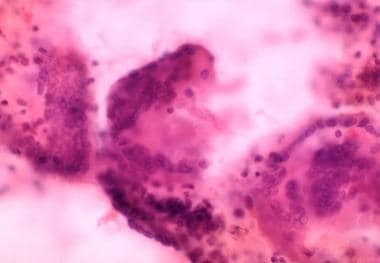 Fine-needle aspiration of subacute granulomatous thyroiditis (De Quervain's thyroiditis): a clinico-cytologic review of 36 cases. Diagn Cytopathol. 1997 Mar. 16(3):214-20. [Medline]. Ofner C, Hittmair A, Kröll I, Bangerl I, Zechmann W, Tötsch M, et al. Fine needle aspiration cytodiagnosis of subacute (de Quervain's) thyroiditis in an endemic goitre area. Cytopathology. 1994 Feb. 5(1):33-40. [Medline]. Shabb NS, Salti I. Subacute thyroiditis: fine-needle aspiration cytology of 14 cases presenting with thyroid nodules. Diagn Cytopathol. 2006 Jan. 34(1):18-23. [Medline]. Ranganath R, Shaha MA, Xu B, Migliacci J, Ghossein R, Shaha AR. de Quervain's thyroiditis: a review of experience with surgery. Am J Otolaryngol. 2016 Nov - Dec. 37 (6):534-7. [Medline]. [Full Text]. Sato J, Uchida T, Komiya K, et al. Comparison of the therapeutic effects of prednisolone and nonsteroidal anti-inflammatory drugs in patients with subacute thyroiditis. Endocrine. 2017 Jan. 55 (1):209-14. [Medline]. Weihl AC, Daniels GH, Ridgway EC, Maloof F. Thyroid function tests during the early phase of subacute thyroiditis. J Clin Endocrinol Metab. 1977 Jun. 44(6):1107-14. [Medline]. Arao T, Okada Y, Torimoto K, Kurozumi A, Narisawa M, Yamamoto S, et al. Prednisolone Dosing Regimen for Treatment of Subacute Thyroiditis. J UOEH. 2015 Jun 1. 37 (2):103-10. [Medline]. Absence of iodine-123 (123I) radioactive iodine uptake in a patient with thyrotoxicosis and lymphocytic (subacute painless) thyroiditis. Laboratory studies at the time of the scan demonstrated the following: thyroid-stimulating hormone (TSH), less than 0.06 mIU/mL; total thyroxine (T4), 21.2 mcg/dL (reference range, 4.5-11); total triiodothyronine (T3), 213 ng/dL (reference range, 90-180); T3-to-T4 ratio, 10; and erythrocyte sedimentation rate (ESR), 10 mm/h. The absence of thyroid uptake, the low T3-to-T4 ratio, and the low ESR confirm the diagnosis of lymphocytic thyroiditis. Example of laboratory values as they vary over the course of subacute granulomatous thyroiditis. The entire episode may evolve through all 3 phases of the disorder over a period of as long as 6 months. Ultrasonogram of subacute granulomatous thyroiditis. A. Transverse image. B. Sagittal image with Doppler analysis. The echotexture is very heterogeneous and hypoechoic. The vascular flow is absent in much of the affected hypoechoic regions of the lobe and much less than would be expected if this were Graves disease hyperthyroidism.